FINRA, the Financial Industry Regulatory Authority, regulates all securities firms doing business in the United States. FINRA is dedicated to investor protection and market integrity. Through research and educational programs, the FINRA Investor Education Foundation empowers underserved Americans with the knowledge, skills and tools to make sound financial decisions throughout life. Conventional wisdom paints a picture of millennials as aggressive, knowledgeable, and confident when it comes to investing, but a new research study sponsored by the FINRA Foundation and CFA Institute debunks common assumptions about millennial investors. The research, titled “Uncertain Futures: 7 Myths About Millennials and Investing,” explores the attitudes and behaviors of Millennials when it comes to finances and investing. Among the many findings that will be of interest for financial educators: While debt and income are major barriers to investing, 39 percent of millennials without taxable investment accounts report that not having enough knowledge about investing is also a critical barrier. Millennials are more likely than Gen Xers or baby boomers to report that their parents talked with them about investing before they were 18 years old (42 percent versus 29 percent and 21 percent, respectively). While this may reflect the democratization of investing and parents’ roles in mediating it, it also underscores the power of early exposure to investing concepts. With that in mind, FINRA launched Millennials & Investing, which can help not only Gen Y but also budding Gen Z investors better understand how to save and invest. 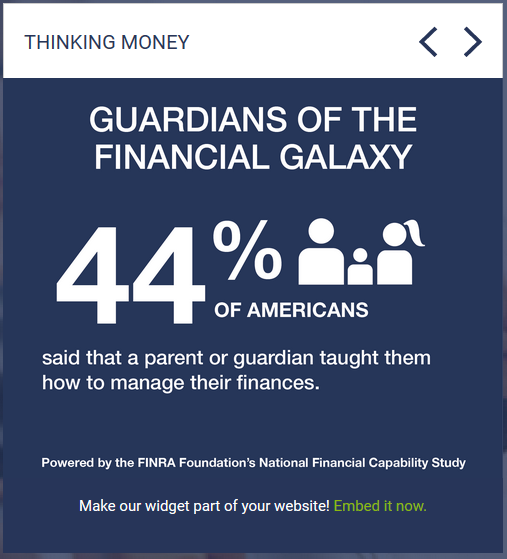 FINRA Foundation “Thinking Money” Widget: A collection of fun facts about money, powered by the Foundation’s National Financial Capability Study, that link to educational resources and tools. We regularly add new tiles, and you can embed the tool (for free!) on your website. 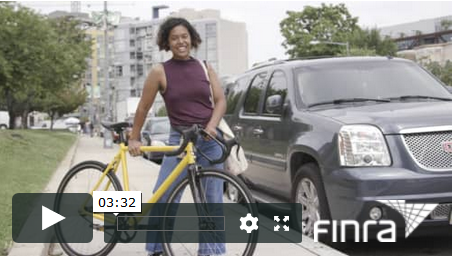 Youth Financial Education Resources: Visit https://www.saveandinvest.org/educate-youth for an array of engaging videos and links to lesson plans and assessment tools. Con ’Em If You Can is a video game that teaches players about the types of persuasion tactics used to perpetrate financial fraud. Play online at www.ConEmIfYouCan.org, or download the mobile app. Financial capability requires strong math skills. These lesson plans cover APR, APY and compound interest for middle and high school students. Subscribe to our “Alert Investor” newsletter for a weekly update on personal finance topics. Like the FINRA Foundation Facebook page. Follow @FINRAFoundation for our latest tweets. 2 in 5 millennial women cite lack of knowledge as a key barrier to investing. @FINRA and @FINRAFoundation are proud to partner with @NatlJumpStart to change that and help all Americans reach #afinlitfuture!